And when a Sunday intercepted in the trip, I was more than glad. I could go out somewhere and I went to……… I’ll come to that later in my next post. Another day post-work I checked the watch and it said 4:00. Perfect timing to venture to any beach to watch a soul-warming sunset. I called up my friend who was whining in office to join me and he readily agreed but I basically had no idea of where to go. Standing in the footbridge of Borivali railway station, I suddenly thought of Gorai Beach. But again had no idea of where it is. Thanks to my dear mobile phone and GPRS, I browsed and found that I was just few metres away from the place. Enquiring a fellow passenger who was standing beside about Gorai, he readily helped with a broad smile (like most Mumbaikars do). We took an auto and enquired about the place to get to get the ferry to reach Gorai. A 10 minutes ride and a 15 mins wait at the ferry point for the ferry to arrive, and I was on it. Here at this point ferries are available to Essel World (It’s a entertainment park) and Gorai. Pretty similar to Manori, here too the ferry ride to Gorai was a regular means of transport. I’ll borrow a para from my Manori ferry ride, it fits here as a fiddle as well – “The boating here is not merely for tourists, it is for regular commuters, very much like in Kerala backwaters or Bengal Hugli. And Manori is not an island, as I was told. 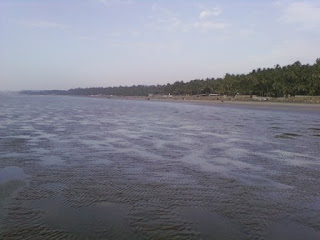 Its mainland separated by backwaters, an excellent place, though slightly crowded. Very similar to it, it’s again the mainland separated by water and here the ride is 10 bucks!!! As soon as we reached the other end of the journey, we were welcomed by the auto drivers so well to offer a ride to the beach. It was freakily expensive at 40 bucks for a 15 bucks distance, but with no other option left, we took one. It left us at the beginning of a little lane whose end was the beautiful, secluded beach. A short walk and we reached the beautiful beach. Not so secluded as Manori but still this won the second place in my heart. It had a gola counter, a chat counter, one or 2 beach games. 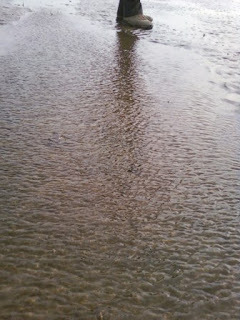 The sea had receded by the time we went. It is one of the common factors seen very clearly in Mumbai unlike Chennai where the sea receding is not so clear. Here the sea had gone atleast a 250 m. As you may see the whole watery part is supposed to be the sea itself and the clear sand strip of land is alone the beach. With lush greenery of coconut trees, I loved the place so much. 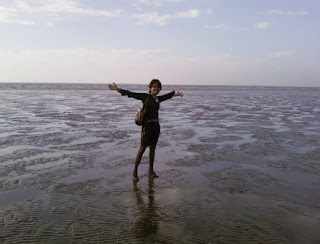 See the distance to which the sea had receded behind me. 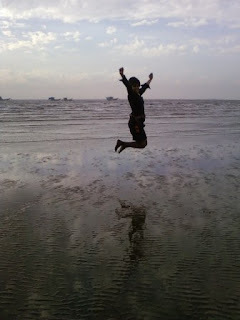 If at all it starts rising, I would have been held up – swimming in sea is too too too different when compared to pool. Yeah, I know, my attire is funny for a beach, but what am I to do.? The business meets in the morning put me in a situation to wear it!!! This was just an unusual shot I wanted to try. That’s my friend’s foot and I loved the reflection. And yeah, my friend has amazing photographic skills. That’s me as I turned... Yeah, I have a point to tell here. I told you already I was here directly from my business meets. Somehow, that particular day morning, my bag was over-whelming and I chucked out my cam. One of the rare days when I didn’t have my cam with me and one of those great days, when I ventured to a new place. Great combination, huh. 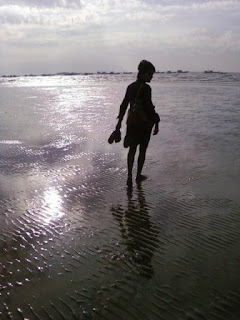 Again (remember my trip to Pettavaithalai Koil without my cam.?) thanking my mobile phone on that!!! 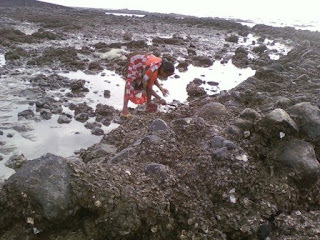 As we walked the length of the beach we came across this portion of a bit rocky terrain. The rocks were filled with God knows what. A lady there was taking something out of those ‘things’ with a sickle in her hand. I enquired her. Well, those were oysters. Considered a delicacy. These oysters stick onto the rocks when the waves push them. But later when the waves recede, the oysters cannot go back to the sea, so are stuck onto the rocks, until the waves come to them again. This intermediate period is utilized by man to satisfy his tongue’s commands. I couldn’t help but feel sorry for those poor oysters. The beach on the whole is sprawling with hardly any human interference. That’s my friend and how many humans do you see in the background? Hardly few. It is always this secluded nature of these roads less travelled make me go crazy about them. Fantastic shot isn’t it? I had to jump 4 times and he had to click 4 times to get the best flight in the frame. I just love this shot!!! Somehow this shot reminded me of Salar-de-Uyuni...!!! That’s Mr. and Mrs. Crabby. You think this is not enough. How can I say about a beach without saying about the shells? 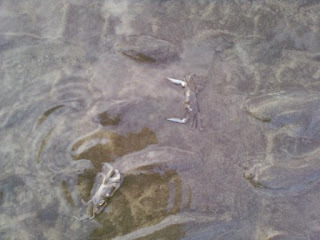 Yeah, these are live shells, walking peacefully on their way as I kept filming them (with my cell phone again, lolz.) on my way. The sun had begun to set by this time and I kept looking at the peacefulness of the scenario and feeling the peacefulness that filled me. The sunrays, kind of filled me. That was the last day in Mumbai and I was thinking of how badly am I gonna miss it. It was at this moment when I suddenly realized that my lunch never took place. A plate of Mumbai aamchi chaat of Channa Dal and a glass full of orange flavoured soft drink prepared locally, my hunger subsided. 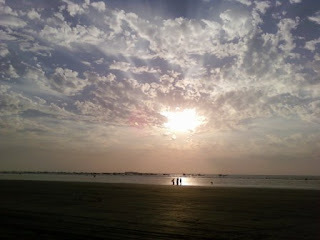 Admiring the fantastic sunset, I told my friend “Perfect sunset, Perfect beach, Perfect climate – Wrong man”. He gave me a look and I instantly recognized that he was about to kill me anytime now. 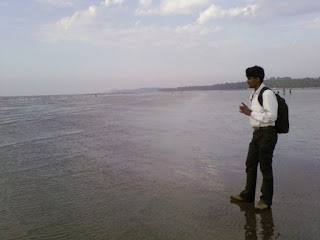 Well, Gorai is a must go with your soul mate or life partner or simply boy friend. Such a perfect place to spend, not just for the sunset, but even the whole day. A perfect dating paradise!!! 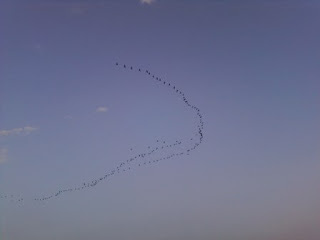 A walk back to the ferry point made me come across the most beautiful sight of the birds’ flight. I was almost sure that I would miss this shot as I had closed my cell phone’s camera by now. I switched and on again and luckily got this shot. Auto could be taken to the ferry point of Gorai. Mumbai auto’s run in meter fare. 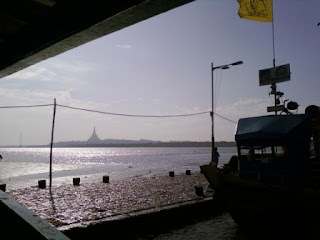 The ferry ride is around 15 mins and costs Rs.10 for one way. Auto ride to reach the Gorai beach. Alternatively, bikes or cycles could be taken. These can also be transported by the ferry and on the other side the biking could continue. 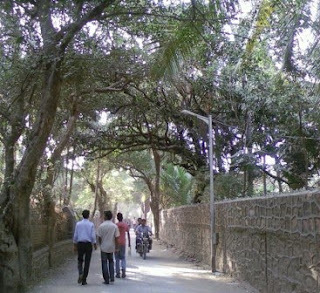 Has several options at all price points located very near to the beach in the beach lane itself. P.S. My trip to Mumbai was supposed to extend to Pune which came to an end abruptly, thanks to terrorists. The German Bakery bomb blast took place 2 days before this trip. May God hold the ones who were preyed upon by this blast close to him and may God take care of the survivors and the friends and relatives of the deceased ones to heal their scars physically and mentally. More than them, may God cure the psychiatric mental illness of terrorists and make them quit terrorism!!! ""And so She (Madame Mumbai) called and I heeded to her invite."" ""Enquiring a fellow passenger who was standing beside about Gorai, he readily helped with a broad smile (like most Mumbaikars do). "" Beautiful shots on the beach. Until now I was not aware of such a beautiful place. But I found Mumbaikars are lot lot lot more friendlier than any where else..
That's right. But in places like these where there are no other modes of transport at all, this happens. Happened in Manori as well. My friend wanted me to hold it in my hand so he could film it. I said a big no. Lolz. Of course, How can I forget your wedding gift.? And the sunset is awesome!! I'm so glad you had time to enjoy Mumbai with its sort-of unexpected beauty and charm. Beach trips are always exciting especially duing summer. I remember the Marina beach in Chennai gets flooded with people in summer just to sit and relax in the balmy breeze. An added attraction is the Lovers Park in the Marina. I enjoyed reading your excellent write up with lovely photos. I remembered my days in Chennai and Goa beaches and ofcourse now I keep visiting some beaches near Kochi which are not as the good as the ones in Goa and Chennai. Very true. Ha ha... The Marina... I've hardly been there twice. Am allergic to the crowd... I'd rather prefer the secluded beaches...!!! Great article with all the details I was looking for! I am going there right away! The jumping shot is phenomenal. Yea beaches around Mumbai is not that clean, but beaches still gives pleasure and happiness to mind and body with the cool breeze and open sky view.